I think it’s one of those Big movies that I was avoiding, ones that are really good, and I also really like and I want to be careful to explain why I like them in a way that makes you like them too, not just appreciate their quality. Ashutosh Gowariker started as an actor. He was an actor in TV serials and art movies, and he met Aamir Khan and Shahrukh Khan when they were fellow struggling actors. When he was ready to make his first ambitious crazy dream of a movie, he went to Shahrukh first because he knew him better (one thing I read said they were roommates during the shoot of the TV serial Circus). Shahrukh turned him down, gently, and so he went to Aamir and Lagaan happened. After Lagaan, Ashutosh could have made anything he wanted with almost any star. And he chose this story and this star. Lagaan was about living in India before it was India. Aamir’s hero didn’t have a loyalty to some greater nation, he didn’t even have much loyalty to his local Raja. His bond was with the men at his side, the village he was born in and the people of that village, struggling to survive together. Over the course of the film, slowly his worldview was expanded. He welcomed in non-villagers to the team, from the Sikh former military man to the white woman who helped him learn the game. His identity was forged as his world-view expanded. Swades is the opposite. In today’s world of great Nation States, borders on a map that are supposed to define your identity, passports and jobs and all the rest of it, the simple sensation of “this is my place, these are my people” can be lost. This is a story of someone journeying back to that simpler sense of identity, finding peace that he had lost without realizing he had lost it. Shahrukh is the perfect hero for this role. He is associated with modernity, urbanity, and the West. It is hard to imagine him going back to life in a village, or coming from a village. If he had played the lead in Lagaan, people would have laughed at the idea of him praying for rain, or wearing simple sandals and speaking broken English. This movie does not demonize people like him, the ones who will never be truly comfortable in a dhoti or without internet. But it suggests there is a middle way, you can be modern and forward thinking and also love your people and your community. 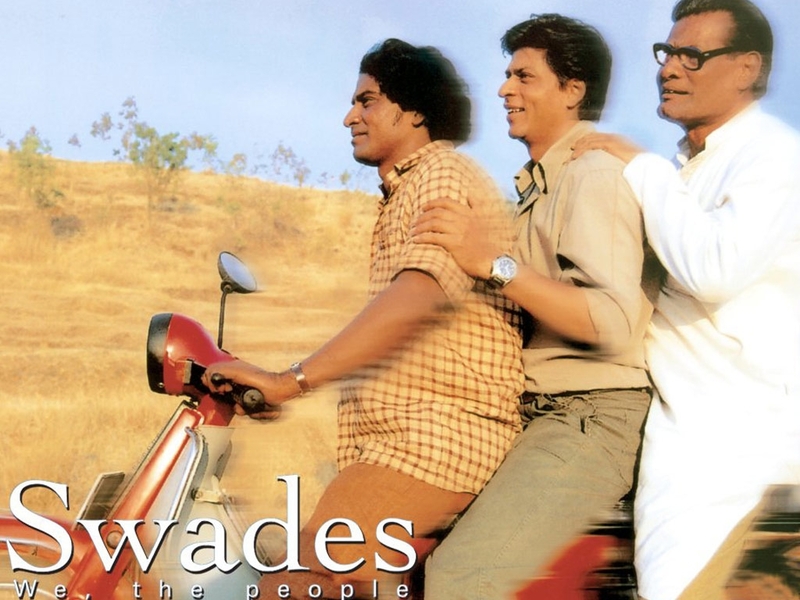 That’s the biggest and most radical message of Swades. Shahrukh’s character is given two choices, to be like most of the village elders and sit back and talk about “culture” and think loving your home means never trying to change it. Or to be an outsider, who can’t see the beauty of the place and refuses to become part of it. And he says “no”, he doesn’t give up all he has learned from outside the village, and he doesn’t give up the village either. He stays, and he works to improve it, loves it enough to make it better. That is why I love this movie. That, to me, is patriotism at its most basic level. It’s not about waving a flag and talking about how amazing we already are, it’s about looking for those places that aren’t so amazing and then rolling up your sleeves and digging in to make them go away. It’s about looking at where you are right now, in this place and this time, and thinking about “what can be better?” And then, “what can I do to make it better?” And then doing it. This is a film with an odd slow start. There is no one dramatic moment, we come in at the culmination of a lot of small moments. Shahrukh is a successful scientist living in America. He has a big apartment, modern conveniences, respect at work, all the things that are supposed to make you happy. But he only has one friend, his fellow desi NASA scientist. This is a life that is familiar to me, living in America. I see it in desi men all the time. Not so much the women, women would be less likely to be sent overseas all alone, and if they are, they have the social skills to make their lives happier. But it is still possible. It’s the flaw in the whole “study hard, go to school overseas, become a success” Indian life plan. It’s a good life overseas, but it’s a very lonely life. Especially if you have spent your life studying in preparation for this life instead of making friends, if you have spent your life in families and schools where friendships and relationships just happened without effort. And if you are from a whole other country, never really feeling right in this new place, never feeling at home. But you can’t go back. That would be admitting failure, admitting that the goal you worked towards wasn’t enough to make you happy. And often it also means that you would be letting down all those people at home, the ones who count on you to send money back to them. This is the misery that Malayalam films are just beginning to dig into with their looks at the life of the overseas workers in the middle east. But those are the jobs no one particularly wants, the laborer jobs, the ones you stumble into by luck not the ones you study for, not the best and the brightest kind of jobs. You keep them and you keep working for the sake of the money that goes back home and everyone knows it. But these jobs, the IIT graduate full ride scholarship overseas and then a work visa and a prestigious position, these are the jobs that are supposed to guarantee complete happiness and satisfaction. And they don’t, any more than any job can. Probably less than any job can, if you remove the prestige and the money, what you are left with is a young man suddenly cut from the warm embrace of a doting family (you need a strong family behind you to succeed in school) and thrust overseas to a completely different world and a completely different people with no skills to support him outside of those he can find in the books he has spent his life with. There are plenty of these young man who manage to make their own way. Usually by finding a new family, marrying someone in their new country or returning home and marrying one of the many eager young women who dream of going overseas. Once you have a family, you can participate in the new community of your new country, Indian diaspora social events based around children and couples, you have a new way to make friends and a new world opens in front of you. But then there are the ones where that doesn’t happen. Where they never quite manage to break outside of themselves and make new connections, or see the way other people are reaching out in their new country in new ways to make those connections. Turn down the invitations to have a drink after work or join the company bowling league and get marked off as standoffish, dropped off the list of social options. It’s an odd situation, because usually the ones to travel overseas are the ones who want to go, the ones who have that urge within them to adventure and something new. Who are able to find a new home and new people where ever they go. And there are plenty of those young Indian men too, ones like Abhishek in Jhoom Barabar Jhoom, entrepreneurs who spent more time planning schemes and finding money and making connections than studying in school. They survive and thrive overseas, while the lonely scholars, the ones who are supposed to do so well, slowly whither away, turn inward, disappear from the world. That’s a really long background, but that is the background Ashutosh manages to draw in with a few quick strokes. Shahrukh’s character has retreated into himself slowly over years living overseas. He made friends in college, but somehow not since then. And most of the people around him have dropped away, leaving him alone in his apartment with his new technology and other toys. His only friend is the other option, someone who is indefinably more comfortable in America. He is married, he has a family here. He tries to give advice to Shahrukh on how to find his own peace, but he can’t really. They are fundamentally different, he is someone who can adapt to any situation, and Shahrukh is one who will slowly whither away outside of his home soil. And so Shahrukh decides to go searching for something that will satisfy him, without quite knowing what it is. He has had a life plan laid out for him, a familiar life plan, study hard, get a scholarship overseas, study harder, get a good job, and then….? He’s reached the end of hte plan and doesn’t know where to go from here. So he goes back, thinking about the last time he was happy, when he was young and loved by his parents and his nanny. His parents are dead, but he can find his nanny. Perhaps by doing that, he will somehow find himself again. As I write this out, I am realizing this is one of a series of roles in which Shahrukh’s characters struggle with some kind of ill-defined unhappiness. In Jab Harry Met Sejal, a very different character is dealing with a very similar problem. He left home with a lot of hope, went overseas, and as the years flowed by realized he had lost a part of himself somewhere and didn’t know if he could find it again. In Billu, he left home and became a movie star, but had no friends, no one who truly knew him. Those roles stand out, but a similar kind of sense of loneliness, of loss, permeates Kabhi Khushi Kabhi Gham, Mohabbetain, Chak De India, Fan, Jab Tak Hain Jaan. There is a certain kind of loneliness, the man who has achieved everything but still wants a family, which sneaks through from his reality to his film roles if there is the smallest opening. And if there is a requirement of the character to have that strange melancholy in him, as in this one, it comes flowing out and cannot be stopped. And so this is a hero that we immediately understand. And the joy of the film is watching his huge gaping holes inside slowly be filled by the two women who understand him. And by the people around him that they put in his way. Shahrukh is not a “savior” in this film. He is one of a community that are already working together to save themselves, he just joins in and puts his shoulder to the wheel along with them to shove the cart out of the mud (just now realized what that metaphor means!). Gayatri Joshi is another type, a more unusual type, which we can recognize. She’s too strong, too intelligent, to be pushed into the limits that Indian society makes for women. It’s not that she fights against them, not exactly, it’s that she looks to high over them for them to even be visible. She lives in the village of her family and the house of her family, she runs her parents’ school and raises her little brother and takes care of her beloved old family friend, and she does it all because she likes doing it. She is not the woman worn down by burdens that are beyond her we see too often in film, she is the woman who sees a path in front of her and challenges in her way and digs in and enjoys them. Gayatri is already saving her village every day, because she doesn’t know any other way to be. And there are others. The Panchayat is useless (of course, stupid Panchayats. If I’ve learned anything from film, and from news stories, it is that the village Panchayats tend to be regressive and entrenched and very very slow to grasp any new idea. There are probably wonderful progressive ones, but they don’t get films made about them or news stories written). But there is an old man, a former freedom fighter who Gayatri brings in to tell his stories to the children in the school. And Shahrukh’s Nanny and her best friend, an old Muslim woman, who give wisdom and support and advice to the women of the community. And Rajesh Vivek, the village postman, who is eager to lend his strength to any scheme that might better the community. And Daya Shankar Pandey, the lower cast man who has big dreams and big energy and is quick to seize any opportunity. They are the ones who carry all Shahrukh’s schemes through, Ashutosh makes sure we see that. Daya travels with him to talk to the farmers and lower casts on the outskirts and convince them to attend school. Rajesh Vivek goes above and beyond to help him get internet access and information he needs. And Gayatri is the one who shows him the way, not through long speeches but through letting him see what is happening and the manner in which to improve it. Gayatri and Shahrukh’s romance is different than any other romance because it is not about love as a journey towards anything else. They go into it knowing that it will probably never be anything more than it is. Gayatri has her home and her life and will not be leaving it. And she would not ask Shahrukh to leave his life, just for her. They are two people of equal strength and intelligence. And equal independence. There is no guilt over leaving someone broken hearted behind, or worry over hurt feelings at the end of it. Just peaceful happiness with what they can have while they have it. No worry for the future because they knew they will both be fine, too old for simple broken hearts, too centered for passionate love affairs. It is love for the sake of love, nothing else. Shahrukh’s journey is not about falling in love, even if there is a love story. Shahrukh learns, over the course of the film, not that he has a responsibility back home, but that long term sustaining happiness only comes through doing good for others. Through digging in and facing problems rather than running away from them. This is not a journey he travels on alone. Daya Shankar goes on it with him. Daya Shankar would be one of those other immigrants, he first meets and befriends Shahrukh because he wants him to sponsor him for an American Visa, he has big plans to start a restaurant chain. This is the kind of forward thinking energetic ambitious person who goes overseas and makes a success of themselves, personally and professionally. Easily makes friends, finds a community, effortlessly finds success where ever they are. But after working with Shahrukh to build a generator for the village, he realizes he would rather spend that energy to make his home better rather than spending it making money overseas. And Shahrukh eventually realizes that all the logical reasons he should be happy overseas don’t mean anything, his true happiness came from making a difference in the lives of people right next to him. This is a big complicated film with a simple idea at the center of it, that true happiness comes from being part of a community and working towards something better, together. This entry was posted in Shahrukh and tagged Ashutosh Gowariker, Friday Classics, Gayatri Joshi, Shahrukh Khan, Swades by mredlich21. Bookmark the permalink. This is such a classic and one despite its long length never fails to keep your attention.. This is such a great review of this movie. I’m torn about wanting to get non-Hindi movie fans to watch this because the beginning is so clunky, and the American cast members (I hesitate to call them actors) are so bad! I’ve thought about showing it but just skipping to when he arrives in India. What do you think the impact would be on not understanding his emptiness? We see it a bit when he goes back to the US after leaving the village. I think you are spot on about the message that we are all Ram and that the secret to happiness is belonging somewhere with a family (by blood or choice) and a community, and working together to make things better. Another lovely message is the old cliche “if you love someone, let them go”. Kaveri Amma has done that with Shah Rukh when he went to the US and didn’t call or visit, Shah Rukh does that with Kaveri Amma when he gives up on the idea of bringing her back to the US, and Shah Rukh and Gayatri do that for each other. Great point that everyone participates in discussions, plans, and executing the work that needs to be done–no one is a savior. Reminds me of The Wheel of Time series–a long and intense series only fit for people who truly love the epic fantasy genre. The series has a great payoff because you realize at the end of the story that the guy who has been set up as “the promised one” for the whole series is nothing of the sort, and all the colorful “side characters” you’ve met along the way each have a pivotal role in saving the world. Super cool and not a typical ending for fantasy. I have a similar debate with Pardes. On my last watch, I was suddenly very aware of how much stronger the second half is, the Indian set first half is a fantasy with no real problems acknowledged, while the second half has all the depth. I think with this film it might work if you just come in with his conversation with his friend about why he wants to go back and find Kaveri Amma. That’s really all you need, learning how lonely he is and how he lost all his family one by one. Excellent point about letting people go! Which could be expanded a greater discussion of India’s relationships with its NRIs. The country shouldn’t try to keep them or punish them for leaving, just hope that they come back on their own. I am definitely not someone with the energy for a long sci-fi series, but I always thought a little bit of that same point is in the end of Harry Potter. Harry “dies” in order to inspire them to save themselves. It is Neville who strikes the final blow, supported by everyone else who along the way had their own moments of bravery. It’s a theme through out the books, that Harry is more just an average boy with the weight of expectation on him, everyone is growing up together and making their own mistakes and having their own triumphs. It’s a very “free will” oriented series. Good point about Harry Potter. It also shares that “free will” thing with Lord of the Rings. We can’t help the times we’re born into, but we can choose what we do with the time we’re given. And, I love Neville. I kind of wanted Neville and Luna to end up together, consoling each other for the loss of their parents, and becoming geeky parents themselves. I love Neville too! And I am so mad that the subtle message around him (that he was on his own hero’s journey in the background of Harry’s all along, and he was the one who showed the purest heart at the end) got lost. And yes, agree about him and Luna. He married some nice Hufflepuff girl and became a teacher, right? Justice for Neville! He deserves a more exciting life! Neville for Minister of Magic! Yep. Hannah Abbott, after a long bachelor-hood as Herbology professor. Oh he could do better! Agreed. Hannah and Dean Thomas would make a cute couple. Again disagree. I read the books after watching the movie and Neville’s aptitude in Herbology stood out for me. That was the one thing he was good at right from the get go and keenly interested in. Neither of Harry, Ron or Neville express any active ambition for powerful positions. That would be Hermione driven by her passion to help the downtrodden. Harry has natural leadership qualities and charisma, but would be content to be in the sidelines with something like Minister of Law Enforcement or something. After a lonely childhood, I love the idea that Neville married a nice lady and chose a career that involves protecting children. Both decisions also connect with the Hufflepuff in him. While his bravery shines in wonderfully unexpected moments, he has a good heart, unwavering loyalty to his friends and willingness to work hard and push himself in the right direction – all Hufflepuff traits. He was always afraid of McGonagall (due to her sternness) and Snape (his outright abuse). It was the Hufflepuff head Sprout that he connected with the most and in return he was her favourite. I like to imagine he and Hannah (she was the Hufflepuff prefect) had little interactions in Sprout’s office which helped when they later re-connected as adults. May be Hannah visited Sprout’s office for nostalgia sake and found Neville instead and they hit it off. Okay, I can come around to your vision of Neville and Hannah. I just wanted more for him in the end than a passing mention. Have to disagree. J K Rowling once said that she toyed with the idea of killing either Harry or Ron, but went against it because she sees them (post series) as war veterans. Harry doesn’t need to die to inspire others, he already does that in book 5 by actually teaching his friends. He put everything on line just so his friends can have a chance to fight for themselves. During his absence in year 7, Neville, Ginny and Luna already picked up the mantle and are leading the resistance from inside Hogwarts. >> Harry “dies” in order to inspire them to save themselves. It is Neville who strikes the final blow, supported by everyone else who along the way had their own moments of bravery. It’s a theme through out the books, that Harry is more just an average boy with the weight of expectation on him, everyone is growing up together and making their own mistakes and having their own triumphs. It’s a very “free will” oriented series. We actually get that when Harry is presumed dead and there is brief lull due to shock and grief. Neville is the one who breaks the silence, doesn’t matter if Harry is gone, they are all still living and they will fight for themselves in Harry and Dumbledore’s name. How isn’t that badass? About the argument that Harry should die for others to shine – Well they do get to shine, and isn’t it “Harry Potter and ….” books that we signed up for? It is free will oriented as Dumbledore explains in book 6. The prophecy only worked for Voldemort to mark Harry and murder his parents, which in turn gives Harry his motivation. But even otherwise, the period with Voldemort at his peak were indeed dark times. The flash back allusions to the original Order of the Phoenix are there for a reason. Harry finds out about Neville’s parents for a reason. Each of which is enough for Harry to fight against Voldemort. I’m all up for protagonists dying when it makes sense in a specific context. Sometimes it is tragic to lose a character and everything they had. Sometimes it gives closure to certain character arcs. But Harry was only 17. He barely had a life before that. We already had another character who was killed even before he had a chance to start his life, and his name is Cedric Diggory. Losing Harry too would be terrible. The fact that he survived and helped re-build the wizarding community is a way more optimistic ending. Oh, I think we actually agree. I don’t want Harry to die, I think the books were written very carefully to include all those points you mention. That’s why I put “die” in quotes, that moment when he is sort-of dead is there for Rowling to show that it wasn’t just about Harry all along, everyone else has their own strengths. That’s why the books are about free will and people finding their own way and everyone being a hero.